It was a promise fulfilled. Dorothy Hinton, director of Community Partnerships and Programs of Communities in Schools of the Rocky Mount Region, said she talked about how the state could bring more resources to the area with Secretary of Information Technology and State Chief Information Officer Eric Boyette during his visit last year to deliver school supplies to D.S. Johnson Elementary School. After some brainstorming, Boyette and his staff connected with the Kramden Institute, a nonprofit organization that collects, refurbishes and awards computers to students and families without a computer in their home, to work out a plan to help students through the use of computers. On Friday, 50 second-grade students at Fairview Elementary School received refurbished desktop computers from the Kramden Institute. Hinton thanked Boyette, who is a native of Eastern North Carolina, for keeping his word in helping bring more resources to Nash-Rocky Mount schools in Edgecombe County. Boyette said technology is the equalizer that erases geographic barriers. Hinton said factors like socioeconomics and students that had the greatest need for desktop computers went into the decison on who received the computers. 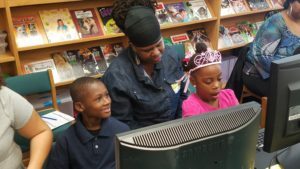 Ann Edge, chairwoman of the Nash-Rocky Mount Board of Education, said giving students computers is an opportunity to decrease the digital divide and help them get connected to the 21st Century online economy and society. Hinton said providing students with access to technology in this digital age is more critical than it has ever been. The computer distribution was underwritten by a contribution from AT&T, which has a history of supporting and expanding educational opportunities that help students succeed both inside and outside the classroom, said Robert Doreauk, regional director of external affairs for AT&T North Carolina. Story originally published in the Rocky Mount Telegram. Eric has been part of the Kramden team since 2013 and currently serves as the Director of Development and Marketing. 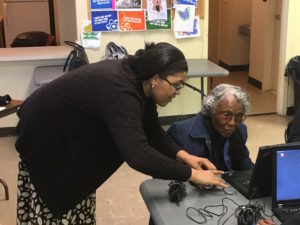 Digital learning instructor Beverly Williams, who is a resident of public housing, gives some hands-on help to Mattie Clay at the Wilson Housing Authority’s first digital learning class at Whitfield Homes Community Center. Clay, 86, said the chance to learn about computers and get the laptop when she was done with the classes pushed her out of the house to attended the digital training. Mattie Clay wants to be able to do the same things that her children and grandchildren do. Gloria Whitley wants to go back to school. Her husband, Bobby Whitley, wants to do away with all of the paperwork that he has accumulated around their home. For all of them, the key to unlocking their dreams is to learn how to use the computer to do the same tasks that many people now consider part of their daily lives. The difference for them and for thousands of people like them in Wilson County is that computers aren’t part of their daily lives. The wealth of information and resources that are available at the simple click of mouse to anyone who has a computer isn’t available to those who don’t have one and don’t come in daily contact with them. This split is known as the digital divide and to help residents of public housing in Wilson overcome it, the Wilson Housing Authority has partnered with the Kramden Institute of Durham to teach basic computer digital classes — 15 people at a time. The classes are taught in four two-hour sessions and start with the basics, right down to how you properly turn a computer on and off. In addition to learning how to navigate your way around the computer and become familiar with it, other sessions teach residents how to use basic office programs, browse the internet, use social media and share information. Anyone who attends all four sessions will receive a refurbished laptop computer, one year of technical support and a USB drive to store their information, all from Kramden. The computers are being provided by a grant that was awarded to Kramden Institute. Kramden also provided training late last year to two people from the Wilson Housing Authority to teach the classes. One of the teachers is Cathy Kent, the housing authority’s resident services director, and the other is a public housing resident, Beverly Williams. Both of the teachers are receiving a stipend from Kramden for teaching the classes. Kent recruited Williams to be the second teacher. Kent knew Williams was used to dealing with technology and has a good way with people, and felt she felt that Williams could use those skills to teach these computer skills to her fellow residents. The classes are being taught at the Whitfield Homes Community Center and there will be two four-week sessions. The first session is underway and is full and there is a waiting list for the second session. If both sessions go well, there is a possibility of partnering with Kramden to offer more classes at a later date. Offering the digital literacy classes is a continuation of the push that the Wilson Housing Authority has made in the last couple of years to improve the access that its public housing residents have to high-speed broadband services and to resources that will help them be able to take advantage of this access. In 2016, the housing authority partnered with the city of Wilson’s Greenlight service to provide low-cost high-speed broadband access to nearly all of the Wilson Housing Authority’s public housing units. Currently, the deal, which includes high-speed broadband for $10 a month and a free Wi-Fi modem, is available to 591 public housing units and 235 families are taking advantage of it. Gloria Whitley said the class and the chance at the free computer was enough to convince her that it was time to complete her GED and go back to school. The 61-year-old said she has worked and volunteered in schools much of her life, but that she would like to get more education so she could possibly work for Wilson County Schools. As motivated as she is to complete the classes, she said her husband Bobby wanted to go before she did. “He wants to get all of our paperwork and finances on the computer and do away with a lot of our paperwork,” Gloria said. For Mattie Clay, 86, the chances to learn more about using computers is solely for her. Reposted from the Herald Sun. Read the original story here. In the Laurel Oaks neighborhood, if it happens, Shaqueelah Shaw knows about it. That’s why she was first in line when she heard Google Fiber was coming to her neighborhood. Google, the tech company best known for its online search engine, is bringing its high-speed internet service to Durham one neighborhood at a time. 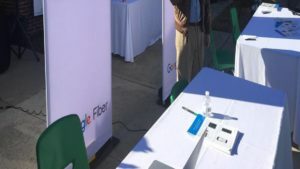 This time Google paired with the Durham Housing Authority to offer its high-speed service free to a public housing neighborhood — the first in Durham and in the state, according to Google officials who were at an unveiling on Saturday at Laurel Oaks. They said more public housing neighborhoods would receive the free service in the future. Shaw said having Google as an option for internet service was a huge blessing. She was switching from a pay service to the free Google service and will save about $70 per month, which is the cost of the company’s Fiber 1000 plan. Laurel Oaks, which is near the intersection of East Cornwallis Road and Alston Avenue, has 30 apartments that all received the Fiber internet connection. It was chosen because of its proximity to Google’s main Fiber line and for the high number of families with school-age children living there. Daniel Hudgins, who is chairman of the DHA board of commissioners, said Laurel Oaks was an ideal candidate for the program. “This broadband access will be such a benefit for the families with school-age children,” Hudgins said. Laurel Oaks, which is one of 16 Durham Housing Authority neighborhoods in the city, is one of the smaller communities. It took about 18 months for the project, which is part of a federal HUD program called ConnectHome Community, to become a reality. Wicks said this is a national initiative and Durham was chosen to be among the first cities to participate. Faster internet is not the only service being offered. Residents are receiving digital literacy training and support, too. Durham Mayor Steve Schewel said Google’s presence in Durham will continue to grow beyond its program with the DHA. Angela Caraway, the founder of the Caraway Foundation, has helped Kramden put computers into more than 500 households in Anson County. She was recently presented with the Goodmon Award for Strategic Partnerships by Leadership Triangle. In this short video, she talks about how she became involved with Kramden and the impact of our partnership. Thank you, Angela, for everything you do! Reposted from the Fayetteville Observer. Read the original story here. Caiden and Kinsley Thompson were attentive as a technician showed them different parts of their new computer, which parents Jessica and Shawn said would be put to good use for homework assignments this year. “They’re always asking me to be on the computer,” said Jessica, explaining the family has one laptop computer that is mostly used for her husband’s work. Now, through a computer giveaway program, the family will have another option to help the children complete their own assignments. 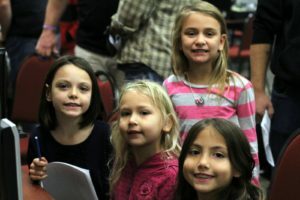 Two hundred children of Fort Bragg soldiers received refurbished computers through a computer giveaway program last week. The program, made possible by a partnership between Lenovo, Kramden Institute Inc. and Fort Bragg’s Army Community Service and Child and Youth Services, benefits children in grades kindergarten through 12. 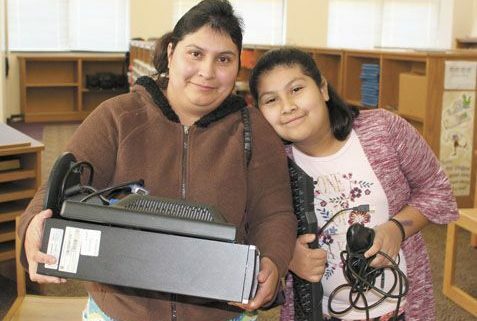 Donated computers are refurbished by Lenovo and Kramden Institute, which then work through Fort Bragg and other military installations in North Carolina to distribute to children of military families. More than 1,250 computers have been donated through the program. “What matters is we’re putting technology in the hands of folks,” said Scott Ottman, vice president of Lenovo sales operations. Before receiving their computers, families met with experts for a tutorial on usage. It’s the sixth year Lenovo and Kramden Institute have donated computers to Fort Bragg children. Families are selected through an application process. The donated computers help children tackle homework assignments without competing for time on the family computer, said Gerhard Guevarra, a school liaison officer for Fort Bragg’s Children and Youth Services. He said he understands children count on computers to complete assignments, but not every child has access to computers at home. By Mark Cone. Read the original story here. Sixty students at Bailey Elementary who did not previously have a computer in their home now have access to one thanks to a recent partnership between the Kramden Institute of Durham and Southern Bank. 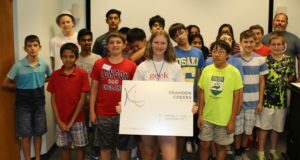 The partnership worked directly with the Kramden Tech Scholars program, which is a program that helps the institute donate computers to students in grades 3-12 who do not have one at home. Funding assistance provided through Southern Bank insures no family incurs any cost to receive a computer. Mandatory training sessions were held for all students who received one of the computers at the school before being allowed to take the computer home. The training covered basic operations of the computer and a parent was required to pick the computer up to take it home. Children receiving computers were selected through a survey that was done of the school’s fourth and fifth graders to determine home computer needs. Once all of the responses were collected and processed, it was determined that fourth grade had the higher need. Earlier grades were not considered because they do not utilize computer-based end of grade testing like the fourth and fifth grade levels do. Fifth grade students already have digital devices through the Nash-Rocky Mount Public Schools 1:1 digital initiative. “Ensuring students have the digital resources they need in order to succeed in the classroom is critical, so we thank the Kramden Institute and Southern Bank for providing the needed resources for many of our students,” Said NRMS Superintendent Dr. Shelton Jefferies. “We appreciate their generosity and are thankful they have allowed our district to be part of this program on many occasions,” he said. We are thrilled to announce the Kramden is one of the nonprofit organizations that Charter Communications chose to receive the Spectrum Digital Education Grant. The funding will be used to offer 6 rounds of our digital literacy classes to senior citizens in Orange, Wake, and Durham counties in 2018. To learn more about the Spectrum DIgital Education Grant, check out the press release from Charter below. STAMFORD, Conn., Nov. 13, 2017 /PRNewswire/ — Charter Communications, Inc. (NASDAQ: CHTR) today announced winners of its Spectrum Digital Education Grants, a new philanthropic initiative designed to support nonprofit organizations that educate community members on the benefits of broadband and how to use it to improve their lives. These grants totaling approximately $400,000 are part of a $1 million commitment to provide digital education in Charter communities through financial grants. Additionally, Charter is committed to PSAs, workshops and webinars to local nonprofit organizations. Charter received more than 200 eligible grant applications and awarded Digital Education grants to 17 nonprofit organizations. LULAC National Educational Service Centers, Inc. Spectrum is committed to improving communities and impacting lives where our customers and employees live, work and play. We do this through our two signature programs, Spectrum Digital Education – focusing on helping families and seniors learn more about digital technology in underrepresented communities, and Spectrum Housing Assist – with the goal of making 25,000 homes safer and healthier by the year 2020. The latest news, resources, and information regarding Charter Communications’ philanthropic initiatives and events, can be found at responsibility.spectrum.com. We’re grateful to the Raleigh ISSA chapter for donating 10 Raspberry Pi computer kits, and to the many volunteers who have helped out at club meetings. Coders Club meets again this month. 25 Kramden computers are being put to use by the Housing Authority of Bowling Green. Check out the article below from the Bowling Green Daily News to learn more. In an effort to increase accessibility, the Housing Authority of Bowling Green received 25 new computers for its two computer labs. 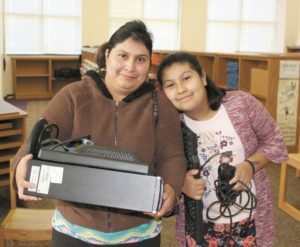 Charter Communications donated the desktop computers, and an event Thursday at the housing authority’s learning center marked the occasion. Kathye Gumm, project manager for the housing authority, said the new computers, which have been installed in the labs, are essential for children and adults who rely increasingly on the internet. 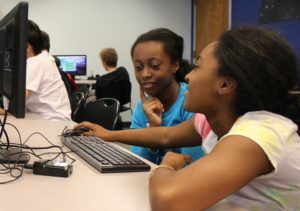 In addition to the many after-school and summer learning programs for students, the learning center computer labs are often used by people who file their taxes in the early months of the year, Gumm said. The Reach Higher Welfare to Work Program also makes use of the computer labs. Participants in the program work in a housing authority department for 30 hours a week and take part in four weekly hours of job and life-skills training at the lab. “If you don’t have access to the internet, you’re going to fall behind,” Gumm said. Along with the donated computers, Charter announced the introduction of a high-speed broadband internet service aimed at low-income households. Spectrum Internet Assist will be available to families with students who participate in the National School Lunch Program and seniors 65 or older who receive Supplemental Security Income program benefits. “We have a lot of people who have access to the internet but don’t have the financial means to get it,” said Jason Keller of Charter, which is partnering with the housing authority to launch the service. Gumm said several residents rely on wireless internet hot spots such as the Graham Drive branch of the Warren County Public Library for internet service. Working with our longtime partner Rise Against Hunger (formerly Stop Hunger Now), 15 Kramden computers are in Belize. 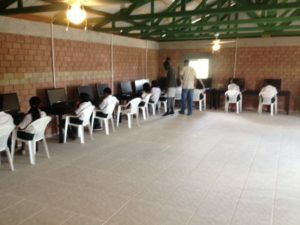 The systems are set up in a computer lab at Silk Grass Methodist School in the Stann Creek district of southern Belize. 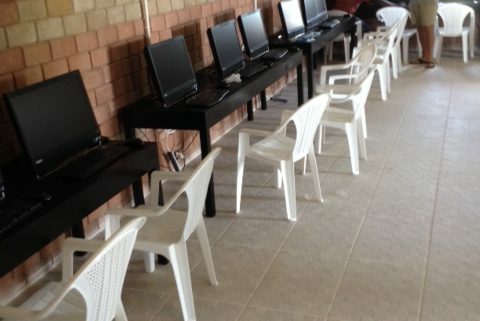 Southern Belize has a significantly higher rate of poverty than the northern part of the country and in the Stann Creek District, only 6 of the 36 primary schools had computers for the students to use.